With vendors now well adjusted to realities of the market, the demand for standard Georgian furniture is unspectacular but steady. “Good-quality antique furniture continues to be strong among dealers, collectors, and those wishing to ill their homes with beautifully made pieces,” said auctioneer Philip Allwood after Moore Allen & Innocent’s (20% buyer’s premium) sale at Cirencester on January 11. Here, as elsewhere, perfectly decent examples could still be had for as little as a quarter of the four-figure sums seen in the boom years, but sustained trade confidence was evident at higher levels. Top-seller was a walnut tallboy which, having a brushing slide to the three-drawer base, merited the appellation ‘bachelor’s’ chest-on-chest. With feather and crossbanded drawers, fluted canted corners and a concave parquetry starburst motif, it was in good condition save minor areas of missing veneers and replacement brass swan neck handles. Estimated at £1000-1500, it sold to an Oxfordshire buyer at £7000. 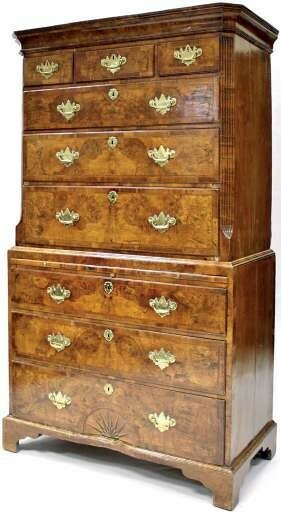 It was one of three good examples of early 18th century walnut in the sale. A four-drawer chest, attractively small at 2ft 5in (74cm) wide, with quartered and crossbanded top and probably original handles, went to the trade at £3200 – more than 10 times the lower estimate. A 2ft 6in (77cm) wide bachelor’s chest, with fold-over feather-banded and cross-banded top opening to reveal a baize-lined interior, went to a local dealer at a quadruple-estimate £2700. Also going to a local dealer at four times the mid-estimate was a George III mahogany serpentine-front chest of four graduated drawers catalogued as in the manner of Chippendale and Haig which sold at £2500. At Lawrences’ (22% buyer’s premium) 600-lot sale at Crewkerne on January 18, a number of Georgian pieces went to UK dealers well above the sometimes over-cautious estimates. A mid-18th century, 6ft 4in (1.93m) tall mahogany chest-on-chest – also featuring a brushing slide – made £4000 against an £800-1200 estimate. A pair of George III mahogany hall chairs of sgabello form, the spooned back above a solid seat and scrolling trestle-style base, estimated at £150-250, made £3000. 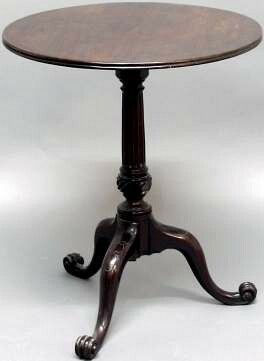 A late 18th century tilt-top table with circular top on fluted column and brass-inlaid tripod base was another example of the sort of George III mahogany pieces which have been selling so cheaply of late. Pitched at an unsurprising £150-200, it was another UK trade buy at £1100. An 18th century mahogany and padouk chest-on-chest – £4000 at Dreweatts. Another chest-on-chest was one of the high points among the furniture offered at Dreweatts (25% buyer’s premium) at Newbury on January 23. 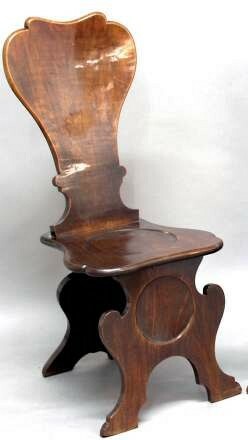 A more manageable size than many at 3ft 10in tall x 2ft 8in wide (1.16m x 80cm), it dated to the late 18th century and was made in mahogany and, more unusually, padouk. It doubled mid-expectations in selling to a private bidder at £4000. A pair of George III wine cisterns on cupboards (one pictured) – £9000 at Thomson Roddick. In need of restoration but always likely to sell well, a pair of George III mahogany wine cisterns on cupboard stands led a 500-lot sale at Thomson Roddick (17.5% buyer’s premium) at Carlisle on January 16. The circular bases to the 2ft 9in (84cm) cisterns were possibly later but they came complete with paktong liners. The cupboards – one with three dummy drawers, the other with two drawers and a cupboard – featured crossbanding and satinwood stringing. Nevertheless, they were of high enough quality to be estimated at £5000-8000. A wine enthusiast from the Far East took the pair at £9000.